Up to that stage I have not in any way Connected with The White Light while we were Exploring the Heavens. So I Requested Sunette to go and ask The White Light a Series of Questions, but then I changed my mind. Sunette was already at The White Light, and I said: “I’ll Ask the Questions Myself.” From my perspective there was only One Way to Ask the Question, and that was to become One and Equal, in fact, with The White Light. So, Sunette Witnessed me Walking Into The White Light and then I asked the Questions as My Being. All this Happened in Quantum Time, because Immediately: The White Light dissipated and Revealed from within it – a Group of Masters that was Manipulating things from Behind the Scenes. They were very Upset, “how Dare I”. And, the Beings in Heaven were also quite Taken Aback, because they did not Expect that that which they Revered, was just an Illusion – something they Believed in, without Understanding how it Functions. And therefore it had More Power than it should have, and whenever something has More Power and Authority than it should have: the Followers will Follow without Question. Similar to How Humanity Follow their Leaders, and Children Follow their Parents – All Structures of Authority that Do Not Produce a World that is Best for All. And that was the Question I Asked: “Why is a World that is Best for All Life Not Existing?” And, in essence, through that: I Challenged their Authority, as the Authority was Not Acting as the Author, as the Scriptwriter, as the Creator that is Best for All Life, and therefore - it was Immediately Diminished and Less-than Life Itself as what was Witnessed with the, what we Call “The Deletion” of The White Light, but that’s not Really how it Functions. But, for the Purposes of Understanding a Deletion, it’s Sufficient. Now, there were certain Consequences with the Deletion of The White Light. With The White Light – All the Angels Ceased to Exist, because: they were Just Dimensional White Light Artificial Intelligent Robots, doing the bidding of the White Light in its Process of Control. Acting, in a way – like the Policeman in the Head, as the Authority Figures that Impose the Rule of Law of The White Light as God, making sure that the Followers do not Question the Authority. It was thus just an Extension of the White Light, and came to an End with the White Light. How Channels could Operate, we will explain in other Blogs, or you could Study Journeys into the Afterlife where an Extensive Account is Given on All these Issues and Why, for instance – Psychics, Channels, Remote Viewers, Lucid Dreamers, Near Death Experiences and so-on – haven’t got a clue of what is Really Going on. 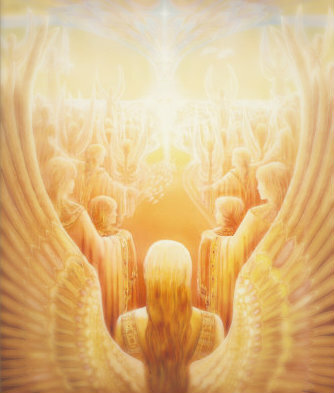 At the same time, another Side-Effect was that the Soul System also Disappeared, and suddenly all the Projected Images of All the Beings in Heaven: was no more. And ALL Beings, in the Universe, in the Heavens/Dimensions – suddenly had the Same Shape. Yet still Individual, Recognizable Awareness. This shape was fascinatingly enough, the Shape of an Egg. And that is How it Continued from then-on. We did Explore HOW these Projections Function – but, they were Nothing but Forms of Shapeshifting, in a way – which some could do Better than Others. This Placed the Whole Context of ‘God in the Afterlife’ in a Total Different Perspective, because - Everything that was Believed, and that existed as Energy that was Extracted through the Mind from Earth to Create the Heavens: was no more, and was Returned to Earth as Source. And what Remained, in a way – was Eggs Waiting to be Born. The Question would be: “How do one bring these Eggs to a Point where they can be Born as Life?” Because, it was Certain: they have Never been Natural Life, they have Only Ever been Unnatural Consciousness that was Based on Energy, that would Allow the Abuse of Life at Levels of Horror that no-one on Earth is yet to Accept as their ACTUAL Responsibility. Was there a God in the Afterlife? Yes and No. Any God that requires Authority, requires Followers and is thus Limited, there is thus No Point to their Continued Existence. Does that mean God exist or do not exist? And if God Exist, what would that Entail?